Acute compartment syndrome is the elevation of pressure in the compartment leading to compromise of the muscles, nerves and the vessels in the compartment. It is a surgical emergency that needs to be treated immediately to decompress the compartment and allow the muscle, nerves, and vessels to regain circulation. Time from the onset to death of certain soft tissues has an upper limit of six hours. The higher the pressure, the less time you have to get that compartment released. Fractures to the arm, leg or heel. The tissue bleeds within the compartment following the fracture, causing an acute elevation of the compartment pressure. Crush injuries from an accident. Prolonged exercise in a patient that may not feel the pressure within the compartment elevating due to numbness in the extremity. Tight extremity casts that allow any inflow of blood into the compartment via the arteries. However, they do not allow outflow through the veins. Early diagnosis is critical to avoid delayed complications of compartment syndrome. Recognize certain risk factors with the patient they have that could contribute to elevating compartment pressures. Usually a severe amount of pain relative to what you would expect with that injury. Stretching of the toes or the foot in an up and down motion passively may cause excruciating pain. A patient whose blood pressure may be low. Sensory changes which include numbness and tingling in the distribution of the nerves that are involved. Paralysis of the muscles that are within the compartment causing weakness with any attempt of movement. A swollen tense muscle compartment so that when you touch it, it feels "rock hard". Measurement of the compartment pressure is important for the diagnosis of an acute compartment syndrome. However, clinical signs and symptoms may be even more important. A handheld manometer is used. A small needle is placed within the compartment and the pressure is measured. Other methods may be used. However, are usually not readily available in a physician's office or ER. Different thresholds have been listed as the most critical pressure needed. above which an acute syndrome has developed. When the compartment pressure and the diastolic pressure are within 30 mm of HG, surgery should be done immediately. It is often best to use this number as some patients may have low blood pressure, which does not allow a critical number to be used for all patients. Emergency fasciotomy is performed over the compartment with the elevated pressure. The skin is incised and the compartment is released. The skin and compartment are left open to allow the pressure to be released. Once the injury has been stabilized and the pressure greatly diminished, secondary closures can be performed. If seen early and quickly treated with a fasciotomy, a full return to function is expected. If seen late, fasciotomies may still be performed. However, permanent injury to the nerves and muscles may have developed. This can cause problems with the muscles of the lower extremity that may require later treatment. This could include tendon transfers to stabilize the foot and ankle or digital fusions to correct toe deformities. 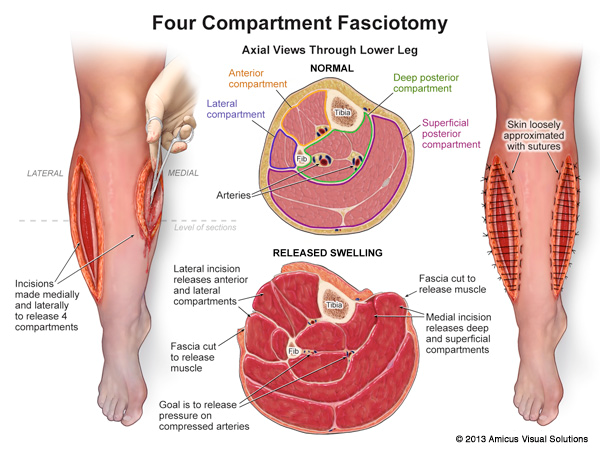 Below is an intra-operative picture of a fasciitomy for acute compartment syndrome of the foot. This was a young male who had injured his foot one week prior and was evacuated out of state. He had presented one week later with significant pain, swelling, and discoloration to the foot. The pain was so severe that he could barely move the foot without significant pain. The procedure was emergently performed to release pressure from the foot compartment.